The thick smoke that's blanketed much of B.C. in recent days has forced some firefighting aircraft to ground and made it difficult to detect new wildfires, officials say. The thick smoke that's blanketed much of B.C. in recent days has grounded firefighting aircraft and made it difficult to detect new wildfires, officials say. Kyla Fraser, a public information officer with the B.C. Wildfire Service, said that despite a relatively lightning-free weekend with few new fire starts, firefighters continue to be extremely busy battling about 545 wildfires. The smoke that's choked the sky in many communities isn't making things any easier for crews. "We have had to ground aircraft in some instances just because visibility was too poor, unsafe to fly," Fraser told CBC. "Smoky conditions also can pose a problem with detection and discovering new wildfires." In terms of area burned, this is already the third-worst wildfire season on record in B.C., with more than 6,000 square kilometres scorched across the province as of Sunday. 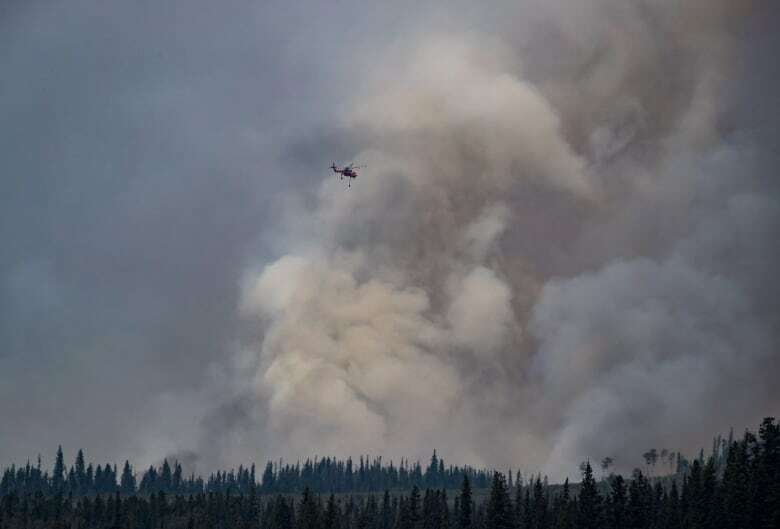 Premier John Horgan will be flying to Prince George and Burns Lake on Tuesday to tour wildfire operations in some of the hardest hit parts of the province. The forecast for this week isn't promising much relief in the way of precipitation, either. "It looks like we're continuing to see some dry conditions right across the province. Most of B.C. is in a high to extreme fire danger rating," Fraser said. "Going into next week, we may start to see some patchy precipitation in the south and northeastern B.C., but this could be accompanied by some wind and lightning potential, so we'll just have to cross our fingers." 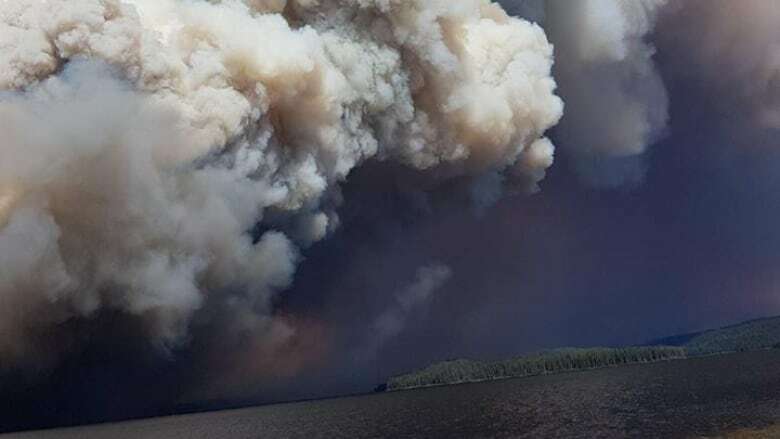 The largest fire continues to be the 850-square-kilometre Shovel Lake blaze moving north from Fraser Lake toward Fort St. James. 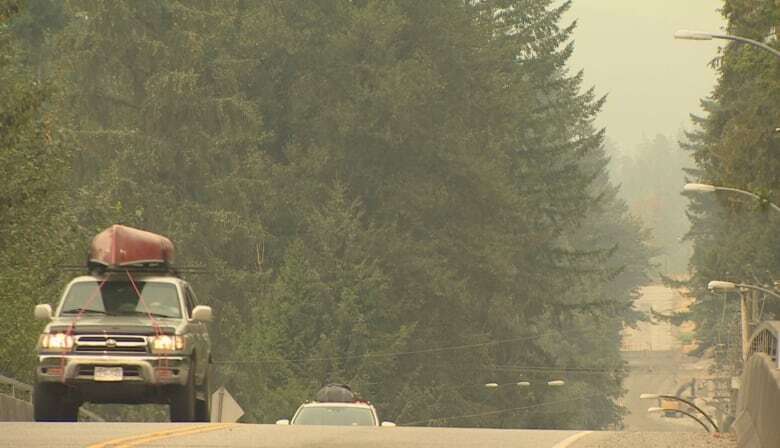 Officials say an increase in wildfire activity in southeastern B.C. is also a concern. In Kimberley, thousands of people are still on evacuation alert. The air-quality health index released by the B.C. government shows a very high health risk in areas from Whistler, Squamish and Nanaimo to the Fraser Valley, the Okanagan, Castlegar and parts of Metro Vancouver. The elderly, children and people with pre-existing health conditions in those areas are advised to stay inside. A grey haze cut visibility and disrupted air traffic in Kamloops and Kelowna on the weekend, but Transport Canada said most flight issues were cleared up by Monday morning. The conditions motivated some people to change their plans, such as not spending the weekend outdoors or cutting short camping trips. She said the conditions made her feel like she had a cold. One of her children has had to use an inhaler. Still, she said it could be worse, considering the South Coast is mostly suffering from smoke and not flames. "We're lucky here, so even for us to say, 'Oh it ruined our vacation,' well it's ruining people's homes, it's ruining wildlife, it's ruining full communities, so I feel blessed living in this part of B.C." B.C. is in its sixth day of a provincewide state of emergency. On Friday, the province announced it would match donations to the Red Cross for people affected by wildfires, up to $20 million. More than 100 Canadian Armed Forces personnel have been deployed to help B.C. personnel. As of Sunday, about 27 evacuation orders were in effect for approximately 2,410 properties.